The Australian won everything there was to win at the third-mile Thunderbowl Raceway in Tulare, Calif., Saturday night. Not even a couple of rain showers could slow him down. His team has been working hard to get the KCP Racing car better on the California short tracks, and “it showed tonight,” said Madsen, as he earned his first victory of the season with championship leader Daryn Pittman second and Sheldon Haudenschild in third. Madsen, who hails from St. Mary’s, NSW, Australia, started the night fastest in practice — three tenths faster than second fastest Donny Schatz. He followed that up by claiming his second pole of the season. Then he dominated the first Heat race of the night, crossing the line about one second ahead of second place Tim Kaeding. That led to him being the first driver to draw for the DIRTVision Fast Pass Dash and leaving seven other drivers disappointed by drawing the pole. A heavy rain shower lingered over the track for about 15 minutes in between Madsen’s Heat and the Dash. It only made him faster. Again, in dominating fashion, he led every lap of the Dash, this time finishing close to two seconds ahead of second-place Pittman. While he already dominated everything up to the Feature, Madsen showed his true speed in the final 35 laps of the night. He pulled away to an early lead, but “The Steel City Outlaw” Tim Shaffer showed muscle early on, keeping pace with Madsen. It didn’t last though. By lap 10, Pittman slid his way underneath Shaffer for second and began to hunt Madsen. Pittman, coming off a heartbreaking runner-up finish in Las Vegas, looked to be the only driver all night who could contend with Madsen. While Madsen battled lap traffic, Pittman closed the gap between them to about a couple of car lengths. And that was as close as he was going to get to the #18’s bumper. Madsen found his rhythm in lap traffic, pulling away to about a four second lead over Pittman, whose #83 Roth Motorsports car was able to close on Madsen again, but only to a second-and-a-half gap. Like Madsen, Pittman was unsure how he would perform at the Tulare short track, coming off strong performances at half-mile speedways. Both Madsen and Pittman drive a KPC Chassis, which is located nearby in Fresno, Calif.
Aside from leading every lap, Madsen’s dominance was showcased by him lapping the field up to 11th-place and catching 10th-place Donny Schatz toward the end of the race. Madsen’s best finish at Thunderbowl Raceway had been 12th. Of his previous three wins, the smallest track he had won at is the 3/8th-mile Deer Creek Speedway in Minnesota. While Pittman finished second, he said he won’t hang his head on the finish. He continues to lead the Series’ championship standings over second-place Donny Schatz — adding 16 points to his cushion between the 10-time Series champion. This is the first time in the storied history of the California-based Roth Motorsports team it continues to lead the points through the Series month-long California swing. The Series continues its trek through California next weekend on Friday, March 15, at Silver Dollar Speedway in Chico, Calif., and March 16 at the Stockton Dirt Track in Stockton, Calif. Even though Madsen began the California tour dominating Thunderbowl Raceway, to him there is still a question on how he’ll perform at the upcoming races. CONCORD, N.C. – Peanut butter and jelly. Movies and popcorn. Jimmie Johnson and Chad Knaus … well, maybe not that last one. But World of Outlaws and NASCAR? Even though three-time NASCAR champion Tony Stewart won a World of Outlaws crown with Danny Lasoski in 2001 and a truckload of titles and trophies with Donny Schatz, the two series being mentioned in the same sentence has become more commonplace of late. 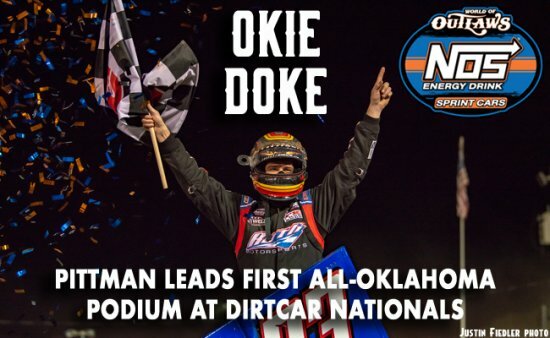 Most recently with the World of Outlaws NOS® Energy Drink Sprint Car Series and NASCAR K&N Pro Series West being paired together for the first time at The Dirt Track at Las Vegas. The race drew a crowd of thousands, a larger media presence and NASCAR drivers. Some drivers were in the stands watching, and a few in the Sprint Car race themselves. 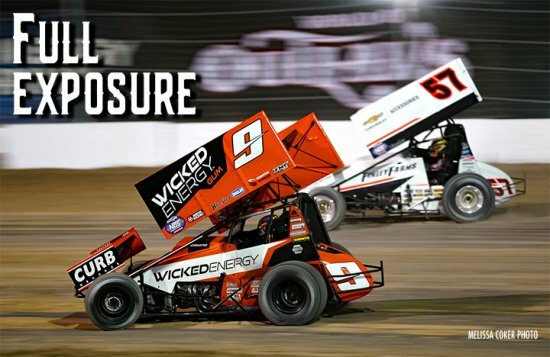 Christopher Bell, Kyle Larson and retired NASCAR driver Kasey Kahne joined the stars of the World of Outlaws for the doubleheader race at the Las Vegas Dirt Track last week and will continue to compete periodically with the Series throughout the season. When the NASCAR stars join the Series, the media spotlight is usually turned on them for the night. But that’s not an issue to some of the Series regulars. From a veteran to a rookie, the opinion stays the same. Rookie contender Carson Macedo, who drives for Kyle Larson Racing, enjoys when his boss and others come to race with the World of Outlaws. Bell, Kahne and Larson grew up racing Sprint Cars. It’s what they love, and they take every opportunity they get to drive one. Kahne, who like Larson owns a World of Outlaws Sprint Car team, said he became enamored with Sprint Cars at a young age and never lost that passion. Even during his years in NASCAR when he wasn’t able to run many Sprint Car races. Through his Kasey Kahne Racing team, and watching the races on DIRTVision, he said he always stayed connected to it. 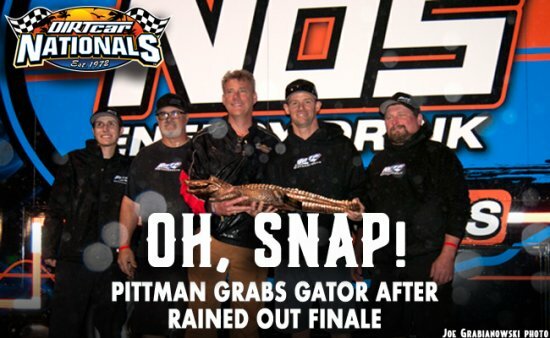 He’s enjoyed watching his team’s accomplishments, such as winning the 2013 World of Outlaws championship and 2018 Knoxville Nationals crown. This year Kahne is scheduled to run about 50 Sprint Car races. Bell is hoping to do about 20 to 25. And Larson sneaks in Sprint Car races to his schedule whenever he can. 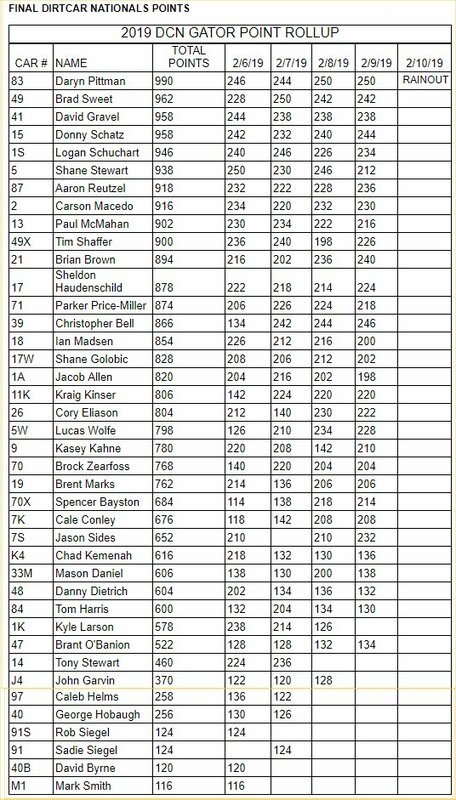 Larson and Bell both stated while there may not be much of a comparison between a Stock Car and a Sprint Car, more seat time never hurts. Larson echoed Bell saying, anytime he gets to race, he feels like he becomes a better driver. “It’s why I try to run a lot,” Larson said. Kinser said it is nice to be able to race with the NASCAR drivers while they’re in the peak of their career. And while they bring a lot of positive exposure to the sport, he said the Series is full of diehard fans that fill the stands most nights. Unlike some other forms of motorsports, Kinser said World of Outlaws drivers are easily accessible to the fans right at their trailer. When Bell, Kahne or Larson attend a Series race, they’re just as accessible as Kinser or Macedo, making the World of Outlaws and NASCAR a favorable combination, like peanut butter and jelly or movies and popcorn. The World of Outlaws NOS Energy Sprint Cars continue their West Coast Spring Break Tour this weekend at Thunderbowl Raceway in Tulare, Calif., before heading north to Silver Dollar Speedway on Friday March 15 in Chico, Calif., and Saturday, March 16 in Stockton, Calif. The next time the World of Outlaws and NASCAR intersect will be during Memorial Day Weekend, when the inaugural two-day World of Outlaws Patriot Nationals takes over The Dirt Track at Charlotte during the nights on May 24-25 while NASCAR runs its Coca-Cola 600 events during the day at Charlotte Motor Speedway. For the complete 2019 tour schedule, plus all the latest news, results and media, go to www.WorldofOutlaws.com. But on lap 14 he lost it. Series points leader Daryn Pittman had inched closer and closer to Schatz every lap, eventually finding grip in the middle of the track and darting by him. He stretched the lead of the FVP Platinum Battery Showdown presented Star Nursery between he and Schatz to about a straightaway’s length. Even with multiple cautions and an Open Red, allowing teams to refuel their car, Pittman never fluttered, always knowing where to find grip on the rubbered down track, gradually moving from the top of the track at the beginning of the race to the bottom of the track by the end. The race was then his to lose. And on the final lap of the race, he lost it. Blocked by a slower lap car – a situation Pittman used to his advantage to win his first race of the season – Schatz took advantage of a clear opening on the high side of the track to get his Tony Stewart Racing car back by Pittman and then held him off to claim a victory he thought he had lost. Lady Luck was good to Schatz. Not only did he find luck in lap traffic, he found luck in his tires holding on until the end of the 30-lap Feature, extended by multiple cautions – as his right rear tire could have been mistaken for a slick stock car tire by the end of the race. Pittman cited drivers’ fear of blowing a tire is why he caught lap traffic in five laps after a late race caution, leading to him losing the race. The victory is Schatz’s 13th win at The Dirt Track at Las Vegas and his 284th World of Outlaws NOS Energy Drink Sprint Car Series victory. He went winless in the first three races of the season for the first time since 2013 – a stat he laughed off, but is glad to get past. “I went three races without a win. Holy hell, I’m glad we’re over that hump,” Schatz said. Looking to spoil the Schatz and Pittman battle for the lead, which ended with a 0.071-sec. gap, was third place finisher Logan Schuchart. He quietly worked his way through the field, from 10th, getting to third by lap 13. He stalked the two Series champions throughout the race, staying close enough to pounce if one bobbled, but neither did. He too was worried about his tires at the end of the race, stating he slowed his pace a little to not blow one. Tires plagued Cory Eliason’s night with his right rear tire blowing in the closing laps of the race, but he still managed to be the KSE Hard Charger for the second night in a row. He finished 13th after starting 24th. While Schatz claimed the victory at the FVP Platinum Battery Showdown, Pittman remains the points leader – by just four points over Schatz. World of Outlaws NOS Energy Drink Sprint Car Series actions resumes March 8-9 at Thunderbowl Raceway in Tulare, CA. As always, you can catch all the action on DIRTVision.com. 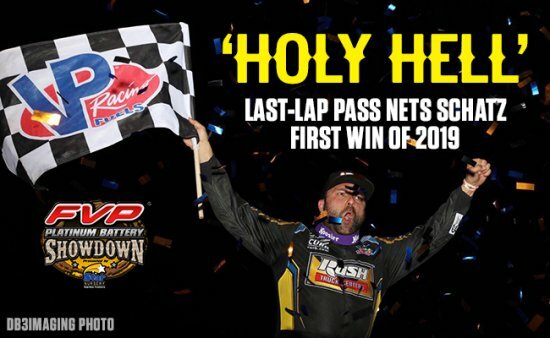 Donny Schatz’s last lap pass to claim his 284th win came on an historic night for the World of Outlaws NOS Energy Drink Car Series. For the first time, the World of Outlaws and the NASCAR K&N Pro Series West were paired together for a thrilling night of racing at The Dirt Track at Las Vegas. It was an event that drew a crowd of thousands in the stands and attracted a wide range of media attention. Echoing the heart-pounding finish to the World of Outlaws race, the NASCAR K&N Pro Series West put on an equally exciting show, with rising NASCAR star Hailie Deegan making a last lap pass for the win in the 100-lap Star Nursery 100. While the 17-year-old is paving a bright future for herself in NASCAR, she couldn’t help but be drawn to the “gnarly” Sprint Cars. After multiple attempts at restarting the race on lap 26, Series officials called for an Open Red, stopping the cars on the front stretch and allowing the teams to refuel their cars. 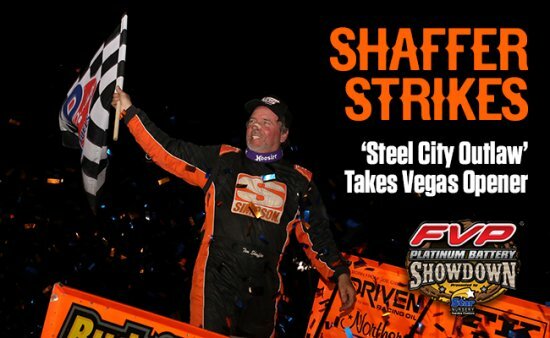 After the cars were refueled, and the race went back to green on lap 26, Shaffer acted like nothing had changed, commanding the lead once again all the way to Victory Lane and claiming his 26th World of Outlaws NOS Energy Drink Sprint Car Series win and his fourth win at The Dirt Track at Las Vegas. While everything worked in Shaffer’s favor, Fresno, CA-native Giovanni Scelzi was not as fortunate. After falling to fourth, from third, at the beginning of the race, he worked his way to second place by lap 10 and began closing in on Shaffer while he entered lap traffic. Scelzi in the #83JR for Roth Motorsports never let Shaffer out of his sight in the closing laps of the race. He even stole the lead from him on one of the restart attempts on lap 26, but a caution was thrown before the field could complete at lap, putting him back in second place. 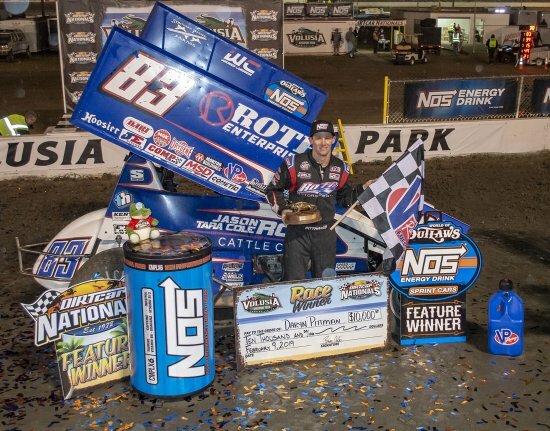 Roth Motorsports has had a strong start to the season with Daryn Pittman winning the two opening races at Volusia Speedway Park – also resulting in his third DIRTcar Nationals championship and Roth Motorsport’s first. Pittman finished seventh, maintaining his points lead from Florida, now eight points ahead of second place Donny Schatz. Like Schatz, Kaeding had to climb his way through the field, finishing second after starting 10th. When Shaffer entered lapped traffic, you could throw a blanket over he, Scelzi and Kaeding. While Scelzi stalked Shaffer, Kaeding in his Sides Motorsports car was close behind stalking them both. Understanding how to drive the Las Vegas track was key to winning according to Shaffer. World of Outlaws NOS Energy Drink Sprint Car Series action resumes tomorrow at The Dirt Track at Las Vegas for the final night of the FVP Platinum Battery Showdown. As always, you can catch all the action on DIRTVision.com. The World of Outlaws NOS Energy Drink Sprint Car Series will trek forward with the schedule to Texas Friday Feb. 22 at Cotton Bowl Speedway and Saturday Feb. 23 at LoneStar Speedway for the East Texas Lonestar Shootout. As always, you can catch all the action from the DIRTcar Nationals and the World of Outlaws on www.DIRTVision.com.